An entire industry is now devoted to producing pharmaceuticals from carefully-mutated animals. Now a biotech company has invented a way to create families of mutant rats who produce antibodies that could sold as medicine. The researchers, who worked with biotech firm Open Monoclonal Technology (OMT), wanted to create what are called "monoclonal antibodies," useful in fighting a number of human diseases. To do this, they needed to knock out certain gene sequences in rats. And they had to be sure that the mutated, antibody-producing rats that resulted would pass their mutations onto their children and grandchildren. In a first for genetic engineering, a group of scientists from industry and academia managed to genetically engineer rats whose children carried the same engineered mutations as their parents (this has been done in other species, but not mammals). In the picture above you can see one example of the engineered rats. 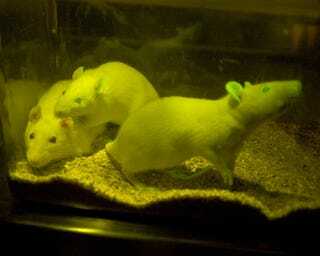 Two of the rats glow green under fluorescent light, but the rat on the right doesn't. He's the result of engineering that knocked out genes responsible for making the other two rats glow. With antibody sales expected to reach $50 billion within five years, many companies have entered the biologics market through acquiring antibody technologies or licensing/fee for service arrangements. Currently, the mouse is the only genetically engineered animal commercially available for the generation of human monoclonal antibodies, and many targets are licensed already. The expense and limitations of the mouse technology create an opportunity for OMT and its new monoclonal antibody platform with unrestricted development options . . . Previously, it took either embryonic stem cells or nuclear transfer cloning — techniques that are not available for the genetic engineering of rats – to create a knockout, OMT used a new ZFN-mediated technique to generate immunoglobulin knockout rats. ZFNs are engineered proteins that induce double-strand breaks at specific sites in an organism's DNA. Such double-strand breaks stimulate the cell's natural DNA-repair pathways and can result in site- specific changes in the DNA sequence. Up to now, ZFNs have been used to edit specific genes in fruit flies, worms (C. elegans), cultured cells and zebrafish embryos, but this is the first example of successful, permanent, heritable gene-editing in a mammal. My question is, how is this any different from using genetic engineering to intervene in evolution? If we can create whole families of mutants, who pass their mutations on to offspring, are we not forcing speciation? There's also something squicky and intriguing about a new species of rat created entirely to produce drugs for humans.